This CellML model runs in both COR and OpenCell to recreate the published results. The units have been checked and they are consistent. We thank the original model author Anushka Michailova for providing us with the MATLAB code for this model. Please note when running a simultaion the step size has to be smaller than 0.005 seconds. ABSTRACT: We extended the model of the ventricular myocyte by Winslow et al. (Circ. Res 1999, 84:571-586) by incorporating equations for Ca(2+) and Mg(2+) buffering and transport by ATP and ADP and equations for MgATP regulation of ion transporters (Na(+)-K(+) pump, sarcolemmal and sarcoplasmic Ca(2+) pumps). The results indicate that, under normal conditions, Ca(2+) binding by low-affinity ATP and diffusion of CaATP may affect the amplitude and time course of intracellular Ca(2+) signals. The model also suggests that a fall in ATP/ADP ratio significantly reduces sarcoplasmic Ca(2+) content, increases diastolic Ca(2+), lowers systolic Ca(2+), increases Ca(2+) influx through L-type channels, and decreases the efficiency of the Na(+)/Ca(2+) exchanger in extruding Ca(2+) during periodic voltage-clamp stimulation. The analysis suggests that the most important reason for these changes during metabolic inhibition is the down-regulation of the sarcoplasmic Ca(2+)-ATPase pump by reduced diastolic MgATP levels. High Ca(2+) concentrations developed near the membrane might have a greater influence on Mg(2+), ATP, and ADP concentrations than that of the lower Ca(2+) concentrations in the bulk myoplasm. The model predictions are in general agreement with experimental observations measured under normal and pathological conditions. 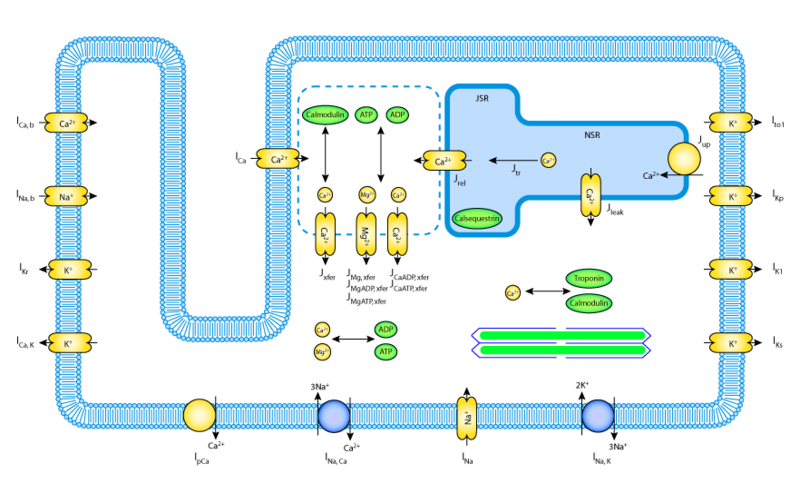 Schematic diagram of the mechanisms involved in the model. Derived from workspace Michailova, Mcculloch, 2001 at changeset 74804747579f.